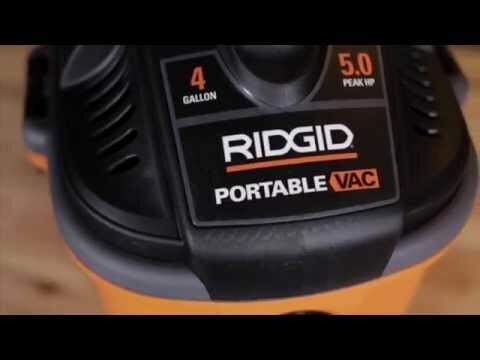 The RIDGID® Portable wet/dry vac is designed to deliver powerful performance in a compact size. Its lightweight, small size and large carry handle provide comfortable portability. Large rear wheels and front casters provide great mobility and the accessory storage caddy keeps nozzles and wands close at hand. The vacuum’s 5.0 peak horsepower motor, 20-foot power cord, blowing capability, locking hose, quiet operation and 3-layer fine dust filter will please Pros and DIY’ers alike. 4 Gallon Portable Wet/Dry Vac is rated 4.6 out of 5 by 890. Rated 5 out of 5 by Michele from Small and Compact Love this little vacuum. It's small and compact and light weight. Good for all jobs. Rated 5 out of 5 by KMark from Small but strong Small enough to be carried and or stored very easily yet picks up anything in front of it. Powerful and fairly lightweight but seems to be made very well. Couldn’t be happier with this vac. Rated 5 out of 5 by Larryo from very user friendly ! It comes with attachments but also other various attachments are available at reasonable price ranges. I also like the length of cord this is very helpful , Most of the time no extension cord is needed to reach electrical receptacles. Rated 5 out of 5 by Bkdjeep1 from Great portable vacuum I bought it because of the size and power, also much better warranty than the competition. It works great, I usually have it attached to my yellow electric sander and it picks up almost all the drywall dust. I used it without a bag at first and of course the filter clogged quickly, so I just cleaned it up and installed a bag. Much better. Rated 5 out of 5 by Patrickincc19 from Can’t go wrong with ridgid. Great products overall. Excellent product. I am a big fan of ridgid products. Excellent products and warranty. Rated 5 out of 5 by JamesL43 from Noisey but great little vacumm. Great vacuum, tremendous about off suction for small vacuum, needs a muffler on the exhaust can not be used without hearing protection. Rated 5 out of 5 by DonnaR from Great Shop Vac This shop vacuum is very durable and has a lot of suction. Would be nice if it had more attachment storage. Definitely recommend. Did I get a dud? Sounds like you've got something blocking the hose. If you attach the hose and the motor changes to a higher pitched sound you've got a blocked hose. Seeing as there is no foam filter with this unit, will it damage the vacuum to remove the filter for vacuuming up liquid? Absolutely! There must be a foam filter on the unit when vacuuming up liquids to prevent debris from getting in to the impeller. Go to your local Home Depot or if you prefer you can order on-line from HomeDepot.com have the product shipped to your local store for FREE. How often do I need to change the filter? I have been cleaning out the ducs in my house and the one I got with the machine today already looks very dirty. not sure, I use the bags for dry pick up only and the filter stays clean. You can feel the bag to see if getting full. For filter, suggest once a year if you use it to clean air ducts only...doesn't sound like you use it a lot. filters can last a long time and look like they are very dirty. You can take the filter off and tap it inside a garbage bag and run fingers over the filter to get some dirt, dust cobwebs off. and after removing the filler I noticed that a good amount of dust collects around the filler . I believe this happens when a bag is not used. In which I plan to do. I'm new to the product this will be my first time using it, being so Ied like to clean it thoroughly, for I'll be using inside my house. Unless you are using it as a wet vac make sure to use a clean filter that is properly installed, (it's simple), and if need be wipe down the motor housing with a damp, not wet, cloth with the unit unplugged.